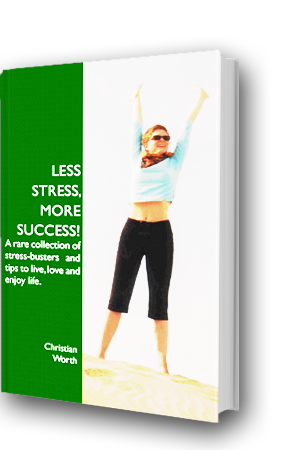 "LESS STRESS, MORE SUCCESS!" tips. Anyone who has an important project (one close to his/her heart) and needs to complete the project faster than if he/she was alone to manage it. – Evaluate a difficult situation from an objective point of view. – Help getting a new project off the ground. – People at the top find an objective person to discuss their ideas with. – Coaching boosts staff performance and brings out Managers’ skills. – Managers clarify priorities and promote achievement. – Motivation and internal communications improve. – Staff are helped to adjust to evolution and transitions. – To get help to get out of a difficult moment, such as a career transition, a creative block or difficulties at work. – To help manage time and organisation in order to gain personal efficiencies. – To overcome fears or undermining beliefs which spoil the enjoyment of daily life. – To better balance work and family life. – To help redirect one’s life towards a more rewarding activity or position. – Students look for objective support in their difficult moments. – Women returning to the work force benefit of an devoted ally in their quest. PROBABLY NOW! It all depends on your goal and how fast you want to get there. Most people want to reach their goal as soon a possible. Life is not a rehearsal. However take your time selecting the Coach who is right for you because for the Coaching is to work you will have to feel comfortable with your Coach. Most Coaches will offer you a trial session to try them for fit. Duration is totally dependent your project and to your commitment to reaching your goal. The shortest period is probably one month, as coaching is based on a shift in perspective and attitude. Coaching works with a continuous relationship between the Coach and the Client and that relationship deepens with time. The Client or the Coach can end the relationship at any time if it is not working or the client has reached his/her goal. After the introductory session, a programme of weekly sessions will be established. Each session lasts 30 to 55 minutes, generally on the telephone and is preceded by a ‘prep form’ sent by the Client. The ‘prep form’ summarises the Client status and desired session outcome. It allows to make full use of the time with the Coach. Face-to-face sessions are also possible if the client supports the cost of travel and accommodation.. Team coaching is also available. It is best performed by coaching mainly the team leader. FACE TO FACE or TELEPHONE? What is the difference? Few people insist on face-to-face coaching only. All of my clients are happy with telephone Coaching even though some started with face-to-face sessions. I always try and have a face to face session with each client, at least at the beginning but for those in far-away places such as Hong Kong or Latin America, photos and voice work perfectly well. People say that telephone coaching allows more freedom of speech and induces a deeper exploration of the difficult topics. And telephone coaching cuts costs considerably as there is no travelling time on either side. The cost is lower than the value. All people coached seem to agree on that point. When a goal which is dear to your heart is reached faster than you thought possible, it is priceless. My fees start from €300/ month or flight of 3 x 55 minutes telephone / VoIP sessions. Coaching is not offered on a cost /hour or /session, but on monthly / flight commitments. Depending on the contract, a month will include three or four sessions. Monthly fees are paid in advance. I also offer Scholarship / Barter / Pro-bono sessions to people with exceptional financial circumstances. WHAT TO WORK ON ? Anything you like and that is important for you. WHAT IS YOUR SECRET WEAPON AGAINST STRESS? Wisdom that is not used is abused. Please share your own tips with me so that I can pass them on. I shall be pleased to publish your tip here, with your name next to it. NOTE: SHARE YOUR OWN TIP: Just e-mail me your tip and let me know if you want to be identified as the source.